Below you will find detailed information on all of our weekly runs and walks, including directions on how to get to each. Our largest weekly run with anywhere between 25-100 runners. We have a 1-2 mile walk or run around Stow Lake, a 2 mile (3K) race-walk to the conservatory of flowers, a 3 mile (5K) carousel run, a 4 mile (6.5K) bison trail run, and a 5 mile (8K) run to the ocean and back. There is also a Cross Fit training option that does a varying routine each weekend. There is a place to store bags and items in a member's car. After the walks/runs, we have various brunch options in the area. If you are new or not sure where to go, feel free to ask other runners where they are going. 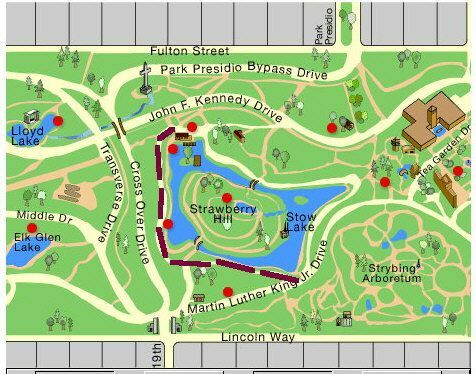 When access to Stow Lake is closed on Kennedy Drive, turn left at the DeYoung Museum and take Martin Luther King Drive. Also see link: FAQ. We also now offer the Cross Training option that meets immediately after First Circle to go over the routine for that day. Generally it consists of a 1.5 mile run interrupted with exercises such as pushup, jumps or pullups at each mile stopping point. 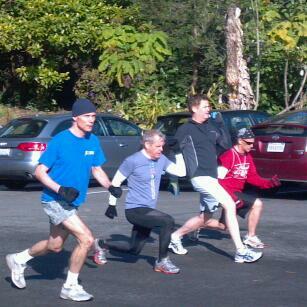 Every Sunday, SFFR has long runs from Fitness SF Castro that leave at 9:00 a.m. Distances range from 6 miles - 16 miles. We set a "time" goal each week so that people are free to run at their comfortable pace and target their "turn-around" time in such a way so that we all get back at the same time and head out to brunch. Contact Mike deLeon at md@mikedelon.com OR Robby Scalise for more information at rcscalise@yahoo.com. Come out and run whatever distance you want or come out for brunch at the end. We don't care what you do during the allotted times that you run. Every Tuesday a group of 15-30 meets at the Ferry Building for a 3 mile (5K), 4 mile (6.5K), and 5 mile (8K) run as well as a walking option as well. There is no place to store bags or possessions so try to plan accordingly. We typically go to dinner afterward. Contact your host, Reggie Snowden at snowdenreggie@gmail.com for any information on the Tuesday event. Every Thursday we meet for an evening Run at 6:30 p.m. in front of Fitness SF on Market and Noe. The runs vary every week and range from 3-5 miles. The courses range from flat to mild hills, depending on what everyone is in the mood for that evening. Contact your host, Byron Delima at fbdelima@gmail.com for more information. We also have glowsticks for added safety while we run. Our club celebrates both running and walking and welcomes people of all abilities. Our regular walks occur every Tuesday at 6:30 p.m. at the Ferry Building (1-2 Miles) and Saturday at 9:00 a.m. at Stow Lake (1-2 Miles). We encourage other events that celebrate walking and hiking as well, and are always lookig for event ideas and new walking routes to try out, so come check us out. We hope to see you at our walks! Stretching: Many of us stretch regularly. If you haven't in a while, or want to check your technique, head over to Runner's World (link) for a thorough guide to stretching for running and walking. Training: Want to train for your first marathon, or simply run longer or faster? SF FrontRunners trains every Sunday during our Sunday Long Run, so head over for an opportunity to learn longer-distance running. You can also head to Runner's World (link) for some good plans to check out. Finally, you can look for training groups, such as Team In Training (link). In-Home Exercise Equipment: We all know it... There are days when there simply isn't time, appropriate weather, or motivation to leave the house for a run or walk. To some, an in-home treadmill can be extremely useful on these days, or simply to train without hills and intersections. Head here (link) for reviews on treadmills. This site not only helps you find a good match for your house, but can also help you find the right type in the gym. For a second opinion, you can head here (link). Finally, if you are interested in something other than a treadmill, such as an elliptical, you can head here for some ideas (link). Ideas for other helpful resources? Don't hesitate to let us know! Send them to board@sffr.org and be sure to include links.